WASHINGTON - Mistakes are not always a bad thing. Just ask any stamp collector about the six bicolored stamps issued by the old U.S. Post Office Department at the 1901 Pan-American Exposition. A limited number of the stamps were printed with their center illustrations upside down and quickly became collectibles. On March 29, nearly 100 years after the issuance of the originals, the U.S. Postal Service will issue three reproductions of the 1901 Pan-American inverts on a sheet souvenir also featuring four reproductions of a "cinderella" that also commemorated the exposition. A cinderella looks like a postage stamp but is not valid for postage. The first-day of issuance ceremony will take place at noon during the Postage Stamp Mega-Event show, The Show Piers on the Hudson, 55th Street and 12th Avenue, New York, N.Y. The Postal Service dedicating official will be Catherine Caggiano, Executive Director of Stamp Services. "This is a wonderful opportunity to give stamp collectors the chance to obtain a unique philatelic item," says Caggiano. On May 1, 1901, the opening day of the Pan-American Exposition held in Buffalo, NY, the Post Office Department (as it was known in 1901) issued a series of six bicolored stamps commemorating the exposition. The stamps celebrated the theme of transportation and were on sale from May 1 through Oct. 31, 1901. A limited number of the stamps were printed with inverted centers: the one-cent stamp depicting the steamship "City of Alpena," the two-cent stamp depicting the train "Empire State Express," and the four-cent stamp depicting an early electric automobile. The Pan-American Exposition was held in Buffalo, N.Y., from May 1 through Nov. 2, 1901. Sponsored by the state of New York, the federal government, and the Buffalo business community, the exposition was designed to celebrate the accomplishments of the 19th century. The exhibits highlighted advancements in industry, transportation, manufacturing and the arts. Despite its celebratory mood, the Pan-American Exposition of 1901 will always be linked with an American tragedy. President William McKinley was shot on Sept. 6 while attending the exposition. He died in Buffalo on Sept. 14. The 2001 reproductions of the 1901 Pan-American inverts feature the one-cent steamship, the two-cent train and four-cent automobile stamps. The three stamps have been printed in their original colors. Each of the stamp's center illustrations will be printed in black. The ship has a green border, the train stamp has a red border and the automobile stamp has a brown border. The 2001 souvenir sheet also includes four reproductions of a cinderella that also commemorated the 1901 Pan-American Exposition. The design of the red and blue, diamond-shaped cinderella features a charging buffalo in the center, encircled with the words "Pan-American Exposition Buffalo." The addition of an 80-cent denomination makes each of the four cinderella reproductions official, international rate postage stamps. A detail of the cover illustration from a 1901 souvenir guide also appears on the 2001 souvenir sheet. In the illustration, which also commemorated the Pan-American Exposition, an allegorical female representing unity among the Americas stands on top of a globe. In her left hand she holds a flag-half Canadian, half American-and her right arm rests on the back of a buffalo. The globe shows the Western hemisphere and includes the words, "Pan-American Exposition 1901. Buffalo, N.Y., U.S.A." An illustration of Niagara Falls appears in the background. 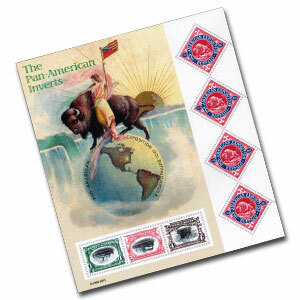 Richard Sheaff, of Scottsdale, Ariz., was the art director for the 2001 Pan-American Inverts stamp sheet.